41724-CZ is rated 4.7 out of 5 by 15. Rated 5 out of 5 by Grant from Delta 24” Concealed Mount Grab Bar This is a very attractive (and useful) accesory for your shower ot tub. Add a safety feature with both strength and good looks. 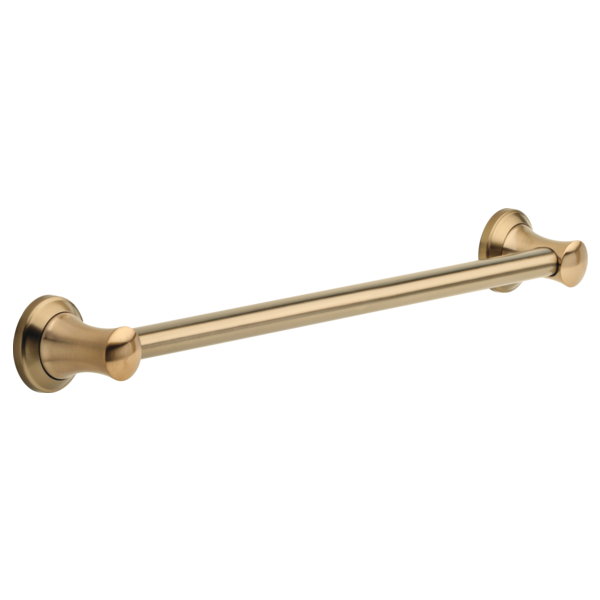 Regardless of age or physical dexterity, this grab bar protects against slips or falls. Highly recommended. Rated 5 out of 5 by Anng from Beautiful and sturdy These work very well in my new master - they are solid yet elegant.. they complete the look with the matching faucet fixtures. Rated 5 out of 5 by Swing from Delta grab bar Works and looks great . Rated 5 out of 5 by Samsnake from Grab Bar for me Easy installation and looks good with the other shower features I purchased. Rated 5 out of 5 by PamD from grab bar I put this grab bar inside a newly refurbished shower that I have done in my house . I am pleased with how this turned out. We would like to use the Transitional decorative ADA grab bar 24&quot; in the shower as a slide bar for a handheld shower. Does Delta have a coordinating stainless mount that would fit this bar? Can you use this inside the shower stall without damage to the finish? Is it possible to shorten the length of the bar? Does this grab bar have texture for grip? Can the Delta Transitional Decorative ADA Grab Bar - 24&quot; be used in the shower and if so, are there any special installations instructions? I want to use this bar in the shower as a towel bar. Will water affect it (ie rusting) and are there special instructions for installation?